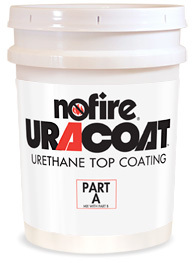 NoFire URACOAT is an innovative, durable coating designed to be used as a topcoat to NoFire A-18, A-18 Marine or A-18NV. The two-component coating dries rapidly to a high gloss tile-like finish with resistance to moisture, alkali, abrasion and chemical attack. Copyright © 2015 NoFire Technologies, Inc.